In Ustrasana, Ustra means Camel and Asana means Pose and hence the name Camel Pose. In this beautiful pose, in the final position body looks like that of a Camel. With the entire spine bent backwards, the chest and upper abdomen look like the back of a Camel. In this pose, stress is upon the thighs and the entire back that is leaning backwards and inwards. Camel Pose (Ustrasana) is considered as an intermediate level pose and comes under the category of backbend yoga poses. In this pose the movement of the body with perfect alignment is essential. As the back is arched to the maximum, the connection of the breath with the movement of the back should happen very consciously. The tail bone is slowly pushed in towards the naval and tightens the pelvic area. Making sure the lower abdomen is also pulled in and upwards thus giving room for the lower spine to settle deeper inside making the pose more comfortable. Chest should be expanded and contracted at the right time to move into the pose. It is always good to have the guidance of an experienced teacher while learning this pose for the first time. Camel Pose is considered a base pose as camel pose variations can be derived from this pose. Camel Pose helps boost energy in the body and hence can be included in flow yoga sequences. 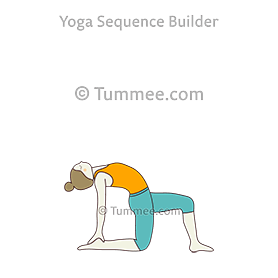 The below cues and yoga sequences added by yoga teachers show multiple ways to do Camel Pose depending on the focus of your yoga sequence and the ability of your students. Stand up on your knees. Separate your knees and feet to hip width. Bring your hands to your lower back with your fingers pointing up, thumbs into your sacrum. Wrap your elbows in towards each other. 1. From Downward Facing Dog, drop your knees and walk two-thirds of the way up your mat. You may want to double up your mat underneath your knees for a little extra padding. 2. Stand up on your knees. 3. Separate your knees and feet to hip width. Tuck the toes under, Inhale, come up to kneeling position. bring your hands on your lower back, fingers pointing up. To move deeper, bring the hands down to rest on the heels. Press the shoulders down and back & take a slightly deeper backbend for Camel pose/ Ustrasana. Take Camel Pose two times, resting in Downward Facing Dog in between. End in Downward Facing Dog. Take Bow Pose two times, resting in Downward Facing Dog in between. End in Downward Facing Dog. Come onto your hands and knees, cross your feet, roll over your heels, and get into position for Bridge. Take the pose two times, ending in Downward Facing Dog. Come to your hands and knees, cross the feet and roll over your feet, coming onto your back on your mat. As this yoga pose makes the body look like that of the back of a Camel and since the Camel is considered to have a strong back, this pose too works on strengthening the back giving it the strong look and toning the muscles around the spine. Benefits of Camel Pose (Ustrasana) under various categories are explained below. Works like magic on the entire spine, giving it the tightness required through the stretch. Stretches the shoulders and gives them shape and makes them strong. Opens the chest and tones the muscles around it thus improving the respiration. Strengthens the thighs and the knees. Generally if one has weak knees the pressure on them can worsen it, but working with blankets below the knees can open the muscles around the knee cap making them gradually strong. Improves flexibility around the spine and hips. Tones abdominal muscles and reduces fat on thighs, arms, and hips. Expands the abdominal region, improves digestion and elimination. Releases tensions stored in the ovaries, and bringes a balance to the entire menstrual cycle and reproductive system. Cures constipation with focus on the abdominal muscles. Improves the nervous system by relaxing the entire spine. Just as we have benefits while we practice a certain yoga pose with awareness of the body, some contraindications should also be kept in mind during the practice of this asana. Only with the supervision of an experienced yoga teacher can we get better guidance on the same. Generally a weak back or an injured back may not give you the support to go into the pose. A neck injur , or someone with spondylitis should surely avoid this. Someone suffering from Migraine, they will find it difficult to balance the neck down and may not enjoy this pose as the pressure will increase and cause more pain. Someone under depression should also avoid this pose as the neck thrown back may not be safe at the moment. Anyone who has high or low blood pressure should perform this yoga pose under the guidance of an experienced yoga teacher or yoga therapist. Camel Pose Variations: Below are some common variations of the yoga pose Camel Pose with base pose as Camel Pose (Ustrasana). 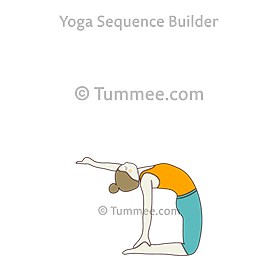 Sign-up to view all 21 variations of Camel Pose and create your own library of yoga poses to easily and quickly plan your yoga sequences. Begin by standing in the centre of the yoga mat . Bending both your knees be seated on your heels in Vajrasana (Thunderbolt Pose). Seated in this position with hands on your thighs, take a few breaths and raise your spine pushing the lower back on to the heels below you. Come on to your knees while raising your body away from your heels and place the back straight . One can take support by placing a blanket below your knees or by folding the corner of the mat and placing it below your knees. Gaze in front and raise the body up with few breaths to focus. Tuck in the tummy too. Now keep the knees hip distance apart or shoulder distance apart, with feet also hip distance apart. The alignment of the hips , knees and feet should be perfect.That is, your legs and feet behind you should not be separated more than the knees , hence knees and ankles are in straight line. Place your hands just below your hip behind you with elbows pointing backwards. Take the shoulders behind you while holding your hips. Take a few breaths here. Raising upwards with tummy tucked in and abdomen tight, slowly with breathing take the upper body behind curved inwards and downwards. Ensure the thighs are tight and straight. The stretch in this pose is from the thighs and therefore having the thighs tight and vertical is necessary. With a deep inhalation, take both palms and place them on the heels behind you. Here raise the heart and chest upwards bringing the spine inwards and release the head and neck backwards feeling the stretch at the neck. Begin a slow breath, and bring the mind to the lower back and neck as the maximum stretch is felt here. With every inhalation, try to push the spine deeper inside while the chest and heart reach higher making it parallel to the floor or yoga mat below you. After a few breaths, slowly exhale and bring the neck and shoulders at comfortable position and release your hands and the entire back . Sit on your knees and heels again and relax. Completely relax the body by bringing the legs out in front of you stretched. Taking the body into the Camel Pose requires a flexible back and neck. But if one finds this pose challenging for the back certain easy ways can be followed to practice this yoga pose. To avoid the impact on the lower back in this yoga pose, you could use a chair by placing it close to your back and legs pushed inside of the legs of the chair. Here by placing some cushions on the chair, kneel in front of the chair with your back close to the chair. Using the support of the arms of the chair, stretch your arms behind you holding on to the arms of the chair and take the back on the seat of the chair. Using the wall too as a support, you could bring your entire body close to the wall by kneeling in front of the wall with tummy close to the wall. Pushing the wall with your tummy and taking the support, bring the arms behind and go backwards. Make sure you have someone to help you with this if you are trying it for the first time. You could start with just one arm, practicing with one arm raised up and the other bent backwards while holding on the heels will give you a slow confidence with the back. After repeated practice with both arms you could move to the entire Camel Pose. If someone has a neck which is stiff or is finding it difficult to "push" it down, then initially you could use some support by placing a stool which is cushioned just close to the neck. You could place this stool close to the wall to avoid it from slipping. For sensitive knees you could support the knees with some thick blankets or cushions to give that extra confidence. If the arms don't reach for the heels or the floor, you could take them behind you and place them on the wall or a chair placed behind you. 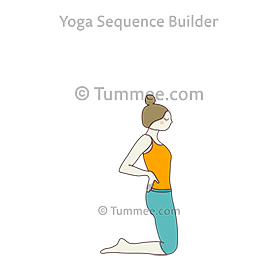 Thus after practicing these variations you could gain confidence and thus move into the actual yoga pose to get the maximum benefit. Sun Salutation (Surya Namaskar): This simple 12 steps in a flow should be a good way to begin the opening of the entire body. One can practice this after a few stretches of the neck, shoulders, arms, legs , hips and back. 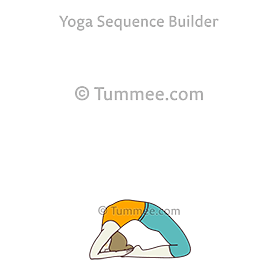 With proper breathing you could use this yoga pose for both stretching or as a cardio exercise to build up the muscles to go further into difficult poses. You could do this for 12 rounds or for 6 rounds depending on the need of your body. Parivrtta Trikonasana (Revolved Triangle Pose): Since in Camel Pose (Ustrasana) the thighs need the strength to balance the body and help the support of the hips, here Revolved Triangle Pose will give that opening to the thighs. In this pose while standing with feet at a comfortable distance apart, raise the arms at shoulder level and twist your upper body from center to the left side from the hip. Bring the right arm close to the left foot and place the palm on the floor. The left foot should be placed at 90 degrees outside and the right foot a close 30 degrees inside. This twist of the upper body and the tightening of the thighs brings the body in control which later helps in Camel Pose (Ustrasana). Navasana (Boat Pose): This simple variation of the Boat Pose, helps in opening up the thighs, back and shoulders. The strength required here is by pulling in the abdominal muscles and ensuring the shoulders and chest remain aligned. This opening of the thighs and shoulders along with the lower back gives the push required to go into Camel Pose. Seated with legs stretched out in front of you, take a breath and raise the legs and thighs about 40 degrees from the yoga mat, moving the upper body a bit behind and inclined about 60 degrees. Balancing the body on the gluteus muscles buttocks, keep your upper body and lower body inclined at the comfortable position and use your arms as a balance by placing them straight in front extended. Dhanurasana (Bow Pose): In this yoga pose the required stretch to the entire back with the support of the arms around the ankles is considered as part of the flow before the practice of Camel Pose. In this yoga pose, as you lie on your tummy, take a deep breath and raise the upper body upwards and backwards and taking the arms behind you reach for both the ankles with the legs bent at the knees. The shape of the body is like that of a bow, thus looking strong and powerful. It is a must yoga pose before Camel Pose (Ustrasana) as the opening of lower back with the back arched gives the strength required for Camel Pose (Ustrasana). Thus from the above yoga poses, one can move into Camel Pose (Ustrasana) without feeling any tightness around the spine muscles and shoulders. The beauty of Ustrasana can be experienced only if the back is strong and flexible. Balasana (Child Pose): From Camel Pose, release the pose slowly and bring the body back and sit down on your knees and heels. Here stretch the body forward and place your forehead on the floor stretching the spine and bringing the chest close to the ground in front of you. Taking the arms behind you place them on both the heels behind you and relax the neck and shoulders. No efforts should be taken to "do" this yoga pose. The body should just fall down and relax. Uttana Shishosana (Puppy Dog Pose): Most backbend yoga poses should end with bringing the spine at its relaxed state and generally in the opposite direction. Here with the body on your knees raise the upper body and move forward placing the arms in front of you by ensuring that the spine is raised as high as possible towards the ceiling with chest and chin on the floor. This pose brings as much relaxation needed to the entire spine. Here the shoulders and chest too are put to relax. Supta Baddha Konasana (Reclining Bound Angle Pose): Move the body from Puppy dog Pose to complete relaxation on your back. Lie on your back with feet placed in Namaste, legs bent at the knees. Here in this pose the back gets its support from the floor and with deep breathing the entire spine begins to relax and with feet at Namaste the lower back or the gluteus muscles too feel relaxed. Savasana (Corpse Pose): As you would have noticed the session should end with a complete relaxing pose, in order to get the flow of blood completely normal and the heartbeat coming back to its normal . This can be achieved in this yoga pose, Savasana. Here the focus should be on breathing and slowly taking the mind to every part of the body, begin to relax. 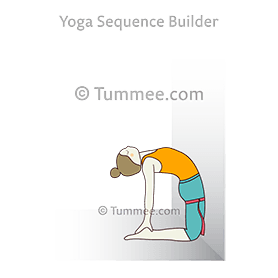 Thus are the most important follow-up yoga poses just after Camel Pose (Ustrasana) to relax the spine and the entire body completely. Purvottanasana (Upward Plank Pose): Being seated with your legs stretched in front of you, place your palms behind you and as you inhale raise your body placing the foot on the floor. The entire body is balanced on the arms and feet with the hips raised high up and neck relaxed behind. This comes after Camel Pose (Ustrasana), as there the neck and shoulders are already opened to make Upward Plank Pose easy and comfortable. Bridge Pose (Setubandha Sarvangasana): Moving from Upward Plank Pose, take the back to the Bridge Pose. Here lie down on your back with legs completely stretched. Then bend the legs at the knees and bring the heels as close to your lower back as possible. With arms rested on the floor besides you or holding your ankles, inhale and raise the entire body upwards and balance on the shoulders and feet. Here at this pose the back is inclined downwards giving that much stretch to the spine. The thighs too are put at work thus improving the calf muscles, hamstring muscles and abdominal muscles. Supta Virasana (Reclining Hero Pose): Bringing in more stretch to the back this pose ensures the completion of the stretch to the spine. From simple Virasana (Hero Pose) take your entire body backwards and just place the shoulders and head on the floor raising the spine inwards. The spine will not touch the floor or mat and remain arched forming a small gap between the floor and the back. You could stretch your arms above your head on the floor or place them on your thighs. 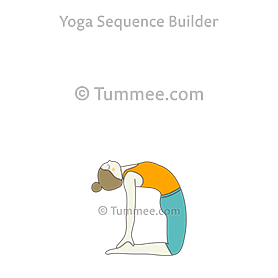 The basic requirement to take the yoga poses to the next challenging level is to have an experienced yoga teacher and to have a good understanding of the body. Breathing with the back bending backwards and balancing the neck in the air requires a bit of understanding of the flow of breath. As you inhale take the position by standing on your knees and legs with toes touching the floor and soles facing upwards. Inhale and keep both your arms on your hips and bend the back backwards and downwards, slowly releasing the neck down and comfortable. Exhale completely here. In this position, slowly breathe and raise the chest upwards and push the lower spine inwards, pushing the abdomen upwards and tightening the muscles around the abdomen. The slow breathing of inhalation and exhalation should bring the body to proper pose and alignment bringing the body to a comfortable position. With every inhalation raise the chest up and spine in and relax the body with exhalation. After a few rounds of breathing in this pose or as far as you can hold in this pose, slowly come out of the pose with a breath. Inhale and release the neck first, slowly taking the hands one at a time from the heels and then bring the body back to the initial position. Here you exhale completely. Seated now on your knees and heels bring the body to relax by stretching the body forward on to the floor with forehead on the floor. Thus at the completion of Camel Pose, remain in the relaxed pose for sometime until the muscles contract completely and the breath becomes normal.